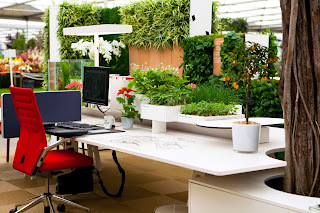 Plants are a fantastic addition to the décor of any office. They look great, have amazing air filtering properties, and most importantly, they are proven to improveemployees’ productivity and reduce absenteeism. The only drawback associated with adding indoor plants to an office is that they require regular upkeep. From selection of the right indoor plants to keeping up with their water and sunlight requirements, there are several considerations of adding plants to your office. Considering this, some businesses may prefer renting office plants to save the energy and time spent on their upkeep while others may consider buying office plants to be a more cost-effective option. To help you make the right choice, we are comparing the pros and cons of hiring and buying office plants. Consider the benefits and drawbacks of both and choose the option that suits your needs. Adding plants to a workplace offers numerous benefits; however, these benefits can only be achieved if the plants look healthy, fresh, and presentable. Neglected, poorly maintained plants with dry leaves not only make your office look untidy, they also have a negative impact on the productivity of your employees. As a result, many businesses prefer hiring office plants from providers who look after the plants and replace them with fresh, healthy plants when needed. No Up-Front Costs — Unlike buying, hiring office plants incurs no up-front costs, making it a cost-effective option for businesses with a limited budget. All you need to do is to pay the costs for the plant hire period which may range from as low as $1 to $20. More Options, Greater Flexibility — Hiring office plants allow you the flexibility to change the planters to compliment your office’s new décor. In addition to this, if you’re moving your business to a place that’s smaller in size, you can always return the plants or replace large troughs with smaller desk top plants. Free Expert Advice — Selection of the right indoor plants is a difficult decision anyone who is not an indoor plant expert. There are only a handful of plant species that can grow and survive in dimly-lit, closed environment of an office. Therefore, working with a provider that offers plant hiring service provides you an added advantage in the form of free advice from an indoor plant expert. While buying is the preferred option in case of commodities that have long durability, such as homes, cars, and equipment, it is not suitable when it comes to indoor office plants. Since indoorplants live for 6 to 12 months, they are required to be replaced quite frequently, making buying a less practical option. In addition to this, businesses with limited décor budget cannot spend a large sum of money on buying plants; therefore, they are better off hiring office plants from indoor plant hire companies.